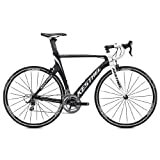 The Kestrel Talon Road Bike is an entry level full carbon bi-cycle. Designed for shear speed, it offers a uniquely awesome riding experience. Equipped with aerodynamic tubing features and tested in A2 wind-tunnels, this bike has a lot to offer in terms of agility, handling and stability at high speeds. The bike comes with a high-modulus carbon fibre fork and frame combination which performs an extremely neat job in controlling the bike’s weight while ensuring exactly right stiffness levels. The bike is extremely easy to handle and has a sporty vibe. Kestrel benefits from being a sub-brand of Advanced Sports as it gets the brake levers, wheels and full aero cockpit from Oval Concepts. The bike is available in five frame sizes: 48 centimetres, 52 centimetres, 55 centimetres, 57 centimetres and 60 centimetres. Equipped with Shimano Tiagra front derailleur and Shimano 105 rear derailleur, the bike is available at quite a bargain. The bike is shipped unassembled and it is highly recommended to get it assembled by a professional bike mechanic for a valid warranty. The other components that make the bike up are Oval Concepts Alloy crankset (50/34T); Oval Concepts Integrated bottom bracket; Shimano Tiagra front derailleur and Shimano 105 rear derailleur; Shimano STI shifters; Shimano Tiagra 11-25T cassette; KMC X10 Nickel plated chain; Tetkro dual pivot brake set; Shimano 105 brake levers; Oval Concepts 310 6061 Alloy handlebar with ergonomic fit; Oval Concepts 313 6061 3D-forged alloy stems; Oval Concepts 300 Tri Saddle with Satin Steel Rails and Kestrel EMS Pro seatpost. Kestrel Talon Road Bike is the older brother of the Kestrel Talon Comp 2014. Equipped with a super-light high-modulus carbon-fibre frameset, this bike has been designed for only one thing – shear speed. The Shimano 105 STI shifters are smooth and lightening fast. Tetkro dual pivot brake set allows precision braking and superior control and stability and is capable of bringing the bike to a quick halt. The power transfer is extremely efficient and the riding quality is awesomely smooth. The bike ships unassembled and for a valid warranty, you must get it assembled by a professional bike mechanic. If you are planning to take the bike off the road often, you might consider upgrading the tires. The crank is on a bit of heavier side and the rear cog set does not perform very well while climbing although it is perfect for flat terrains. If you have been looking for an entry level full carbon bike within a reasonable budget, you can definitely consider trying this one.